A history of rails in Washington DC. Recently, an author writing a book asked us how his “character” would have gone by train from Chicago to the Pentagon in 1944.The Pennsylvania Railroad (and all other railroads entering Washington DC) used Union Station. The formerly huge rail yard near the Pentagon, “Pot Yard”, was freight-only. We took a look at DC Transit map and nothing shows as going across to the Pentagon. 1958 and 1944 are identical. This was the main trolley provider in DC. I confirmed this here. Took a look at this and found an interurban line that crosses the river at Arlington Junction and connects with DC Transit. So their MIGHT have been a rail route. But these interurbans were “on their knees” after the Depression and could not gear up to adequately serve the Pentagon. More discussion on topic. I’m guessing the Army (did they control the Pentagon before there was a Department of Defense???) set up some bus routes. Probably a bus stop and a desk at Union Station? Historically, Washington, D.C. was one of the first cities in the United States to have regular rail service (over the Baltimore & Ohio). Later on, the big railroads such as the Pennsylvania served Washington. Today, freight is handled by CONRAIL and it’s successors, long distance passenger by AMTRAK, suburban service by the Maryland Department of Transportation and Virginia Railway Express; and last, but not least, local transit by the Washington Metropolitan Area Transit Authority. DC Transit, a system of streetcars, fell apart several years before the WMATA (Metro) came into existence several decades ago. Metro consists of 6 lines with 91 stations and runs several hundred cars. There were several little-known railroads around Washington as late as the 1950’s. Washington & Old Dominion ran from Rosslyn, Va. (across the Potomac River from the Georgetown section of Washington) to Purcellville (past Vienna). Passenger service was discontinued in 1951 over this 45-mile line when a U.S. Mail franchise was cancelled. In its last year of operation, each trip averaged 17 passengers. The main freight business operated from Potomac Yard. Diesels replaced earlier electrical equipment. At one time, the Old Dominion served the dairy region which supplied most of the milk in the Washington area. The W&OD began in 1847 as the Alexandria, Loudoun & Hampshire in hopes of competing with the Chesapeake & Ohio Canal. It actually ran by the time of the Civil War. Plans to scale the Alleghenies never materialized and rails only reached Bluemont, a resort on the eastern slope of the Blue Ridge Mountains. It became the Washington & Ohio Railroad in 1868 and added “Western” to its name in 1883. Until 1912, it ran trains into Union Station. In 1912, it became the Washington & Old Dominion, was electrified, and moved its passenger terminal to Georgetown. Trains crossed the Potomac on an old aqueduct bridge. A branch to Great Falls, VA. was abandoned when the amusement park there closed. At the end, passenger equipment was usually a diesel-powered combine which took 2 hours and 45 minutes to go from Rosslyn to Purcellville. In 1956, The Chesapeake & Ohio bought the W&OD thinking a power plant was going to be built. It wasn’t, but the C&O subsidiary fared well during the construction of Dulles Airport. The Rosslyn branch was sold in 1962 for highway use and in 1965 the W&OD petitioned for abandonment. Much of the line is a hiking, biking, etc trail. The East Washington Railway Company ran from the eastern tip of the District of Columbia a short distance into Maryland. Into the 1950’s, it was a three mile line serving the Benning power plant as well as some private fuel companies. It was the remnant of the 28-mile Washington & Chesapeake Railway which had been built in 1891 to take vacationers to Chesapeake Bay. A 1933 hurricane and automobile competition threw this line into receivership. It connected with the B&O at Chesapeake Junction and ran due east to Seat Pleasant. The Washington Terminal Railroad was organized by the Pennsylvania and B&O in 1901 to operate Union Station and the surrounding trackage. As well as these lines, it also served the C&O, Southern, Seaboard, Atlantic Coast Line and the Richmond, Fredericksburg & Potomac. In 1951, it operated 58 miles of trackage with 28 switching locomotives and 25 service cars. In 1964 it had 21 diesels and 15 other cars. By the 1980’s, it was down to 7 locomotives and 32 miles of track. The WT is now a part of AMTRAK. It was able to service lines using steam, diesel and electric power. The U.S. Naval Gun Factory railroad had 9.3 miles of track within the walls of the Washington Navy Yard. In 1951 it had six locomotives, nine locomotive cranes, and 77 cars with which to move heavy ordnance. It also had another mile of track at the Bellevue Annex which switched with the B&O’s Anacostia branch. The Gun Factory connected with the Pennsylvania through the Jersey freight yard. As well as its main mission, it also served as the storage yard for Presidential cars such as U.S. Car No. 1 (the armor-plated Pullman “Ferdinand Magellan). As well as owning the bridge from Washington to Virginia used by all passengers from the south, the Pennsylvania Railroad also owned the Rosslyn Connecting Railroad. This line ran from Potomac Yard to Rosslyn and used to supply the Pentagon (which it almost touched) with coal. The Richmond, Fredericksburg & Potomac was chartered in 1834 and opened to D.C. in 1872. It was a pure “bridge” road and was always controlled by connecting roads. The B&O had two branches in addition to its main line to Cumberland. One ran from Hyattsville to Anacostia and on to Blue Plains (12 miles). During World War II, a temporary trestle across the Potomac provided an emergency detour in the event the main Potomac bridge was out of action. The other B&O branch was the Georgetown Branch which almost encircled the District. It was made up from three old local lines: the Metropolitan Southern Railroad (1892-1910); the Washington & Western Maryland Railroad (1890-1909); and the Georgetown Barge, Dock, Elevator & Railway Company (1889-1910). It connected with the main B&O just north of Silver Spring, MD. It went through the suburbs of Chevy Chase, Bethesda, Kenwood and Westmoreland Hills. It went through a tunnel under Potomac Heights, crossed the old C&O canal and ended in a freight yard in Georgetown 11 miles from Silver Spring. In the 1950’s, there was a 660-horsepower diesel in Georgetown and the B&O ran a weekly freight over the line. It remained alive into the 1960’s but is no more. The smallest line in the Washington area is 700 feet long. It links the Capitol with the Senate Office Building. It has two “trains” and runs 225 trips a day hauling 18 passengers each trip! There were only five railroads using Pot Yard before Conrail: RF&P (handling traffic for both SAL and ACL before the SCL merger), PRR later PC, B&O, C&O and SOU. SOU had their own yard in Alexandria for local traffic, but operated into Pot Yard for interchange traffic. They also hostled their engines to their own yard for service, then brought them back for outbound trains. Washington & Old Dominion Railroad. Norfolk & Western and Western Maryland never went into Potomac Yard. Maybe their engines did on occasion, but that would have only been on some other road’s trains. In February 2001 I had the need to visit Washington. I flew into Baltimore-Washington airport and caught the biggest bargain in town: Only $5 from BWI to Union Station. Arriving in Union Station, it is busier now than for a LOT of years: Amtrak, MARC, and Virginia Railway Express (VRE) had much equipment in the station. I saw Beach Grove, an Amtrak business car parked there. The Washington Metropolitan Area Transit Authority (WMATA) was created by an interstate compact in 1967 to plan, develop, build, finance and operate a balanced regional transportation system in the national capital area. The Authority began building its rail system in 1969, acquired the four area bus systems in 1973 and began operating the first phase of Metrorail in 1976. The WMATA Green Line parallels the CSX (ex-B&O) main from College Park out to the Greenbelt yard. Both Metro and MARC stop at College Park and Greenbelt. The Green Line extends from Greenbelt (Maryland, on the Capitol Beltway) to Anacostia with expansion planned to Branch Avenue. When the Green Line was opened, MARC abandoned its Berwyn station. Traffic on CSX includes intermodal and autoracks, general freight, and MARC. Most of the freight traffic is at night. The Red Line parallels the CSX (ex-B&O) Metropolitan Line (MARC Brunswick Line) from Union Station to Silver Spring and Twinbrook to Shady Grove. MARC stops at Rockville, Union Station and Silver Spring. Note these two segments are on opposite ends of the Red Line, but they are within three miles of each other around the Beltway (the Red Line is U-shaped and runs from Glenmont to Shady Grove). The Orange Line parallels the Amtrak Northeast Corridor from New Carrollton to Cheverly, and the ex-Pennsylvania RR freight bypass from Cheverly to Minnesota Ave. Of interest are probably the only 100 mph speed limit signs you are ever likely to see. What little freight comes down the Corridor through Landover uses this line to bypass Union Station, crossing the Anacostia River near Pennsylvania Ave., and rejoining the passenger line at Virginia Avenue Tower (near 2nd and E Sts SW) to go over the Long Bridge to Potomac Yard (or whatever remains of it). Amtrak and Virginia Railway Express (VRE) trains share tracks with CSX from Virginia Avenue to Pot Yard and from there south. The Orange Line continues west to Vienna-Fairfax. The Blue Line begins at Addison Road (Maryland) and parallels the Orange Line from Stadium-Armory to Rosslyn. It then goes past Arlington Cemetery to join the Yellow Line at the Pentagon. The Yellow Line Metro crosses the Potomac from downtown on its own bridge near the Long Bridge, and follows an S-shaped route to serve the Pentagon and National Airport. The Metro (now both Yellow and Blue) then runs on the east edge of Pot Yard down to Braddock Road (south end of Pot Yard) and parallel to CSX (ex RF&P main) from Braddock to King St. (Alexandria Union Station). From there, the Blue Line continues to parallel the old RF&P to its terminal at Francona-Springfield. The Yellow Line ends in Huntington. · Manassas Line runs east to Alexandria then into Union Station. · Fredericksburg Line runs northeast to Alexandria then into Union Station. 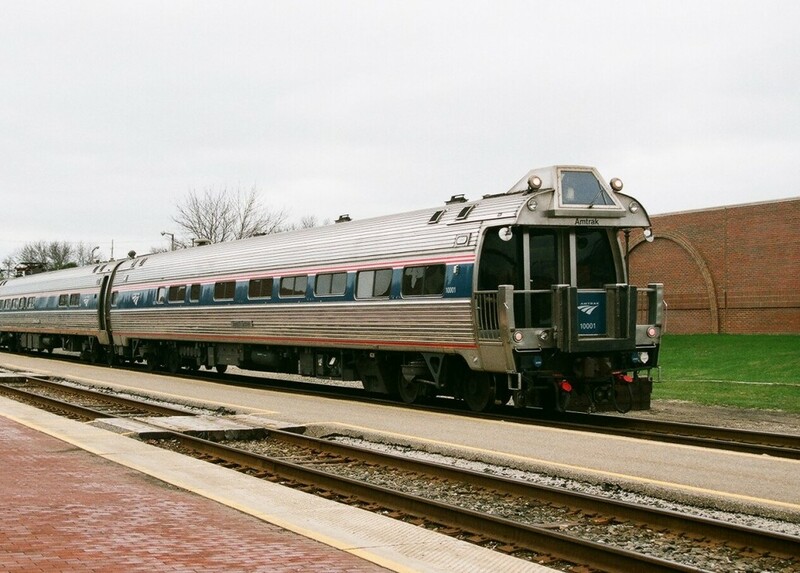 · The Penn Line (Amtrak) runs from Perryville, MD through Baltimore to DC. · The Brunswick Line (CSX) runs from Martinsburg, WV through Harper’s Ferry and Brunswick to DC. · A new service is on the old B&O (CSX) branch from Frederick, MD to CSX’s (B&O) Old Main Line. The train travels from Frederick to the Old Main Line on a newly rebuilt track, run over the Old Main Line to Point of Rocks, then swing around one leg of a wye track to continue it’s trip on the Metropolitan Sub to DC. Commuter trains have been running between Baltimore and Washington for many years. After the formation of Amtrak, the Penn Central continued commuter trains for a while, I believe under state subsidy. Same thing on the B&O (later Chessie System). The equipment was pretty ragged on both lines, and at one point B&O was leasing cars. The State of Maryland became involved slowly, first with simple subsidies, then purchasing equipment, and finally taking over every aspect of the service except for actual operation of the trains. It was announced within the last year or so that MARC will build it’s own maintenance facility in Baltimore (now it uses CSX’s Riverside facility and Amtrak’s Ivy City) soon. My guess is it will then hire it’s own people to maintain the equipment, at least in Baltimore. Chances are that MARC will still service some of it’s equipment in DC. There is also a storage yard and light maintenance facility for MARC equipment in Brunswick, MD. Washington’s Metro has been under development for several years since the trolley system was abandoned. In the December 1967 Newsletter from the Institute for Rapid Transit, a 95.3 mile system was proposed (initially 25-miles). It planned to serve 272 million riders by 1990. Discussed was a line to Rockville (Tenley Circle, Bethesda) which was proposed extending to Gaithersburg and Germantown. The November 1969 Newsletter from the Institute for Rapid Transit showed Metro as a 98-mile system which would be completed by 1979. 47 miles would be subway; 38 miles in DC, 30 miles in MD; and 30 miles in VA. There would be 86 stations: 44 in DC, 22 in MD and 20 in VA. Cars will be 75 feet long and have 81 seats with capacity of 175 persons. It was now estimated to serve 296 million passengers by 1990 with an average weekday patronage of 959,000 riders and 2-hour morning peak of 252,000. 30,000 parking spaces for commuters were proposed. Phase I would be Union Station to Rhode Island then Connecticut Ave to Dupont Circle. Metrorail (what WMATA seems to now call Metro) now operates 8 3 stations and 103 miles of line. Metrorail and Metrobus serve a population of 3.4 million within a 1,500 square mile area. The total system is now 103 miles and has 83 stations. Of these 50 miles and 47 stations are subway, 44 miles and 31 stations are surface, 9 miles and 5 stations are elevated. The operating fleet of 762 cars are 75 ft/23 m long and 10 ft/3m wide. Operating speed is 59 m.p.h. maximum with an average of 33 including stops. Cars usually run in 4 to 6 car trains. There are 557 escalators and 180 elevators in the operating system. The longest escalator in the western hemisphere (230 ft/70 m) is in the Wheaton station. Operating hours are from 5:30 a.m. weekdays and 8 a.m. weekends to midnight Sunday through Thursday and 2 a.m. Friday and Saturday. Of interest to me is that Verizon Wireless subscribers can use their cell phones while riding Metro in tunnels as well as on the surface. Passengers using other cellular services can use their cell phones only on surface or aerial locations. There are a number of Metro yards. The one on the Red line between Union Station and Rhode Island Ave. is plainly visible from the metro and nowhere else; another is in Glenmont, tucked behind a garden apartment complex and is not very visible. The one at the New Carrollton end of the Orange line is not very visible either. The Yellow line yard is behind the Norfolk Southern yard. Most of MofW equipment seems to stay at the Union Station yards. At present there are six junctions, four of which are underground. The one outside the Pentagon station is interesting because it is so close to the station; the two tracks run on different levels through the station. If you look to the west you can see the other tracks come in and the levels change. The yellow-blue line junction just before Eisenhower Ave. is above ground and is the only readily visible wye in the system. There is also a connection between the green and red lines at Fort Totten (that’s what the seemingly useless strip of track is for that dives down between the red line tracks just east of the station). This is the track that used to allow the green-to-red express service during rush hour. The final junction has no purpose except to connect the whole system together; it joins the blue/orange line to the red line in the vicinity of the two Farragut stations. Two other oddball points are the junction with CSX and the hidden station on the Red line. The hidden station is where they take the money at night. *Chesapeake Beach Railway…Chartered – 1891 Operated – 1896-1935 Right-of-Way still visible from Seat Pleasant MD to Chesapeake Beach MD. Some stations and artifacts still exist. Some old rail etc. found in places in rural MD. Passenger car exists (altered) at Chesapeake Beach MD. *East Washington Railway…Chartered – 1935 Operated – 1935-1978 Right-of-way still visible from Chesapeake Jct(CSX) to Seat Pleasant MD and to PEPCO generating plant at Benning Wash DC including trestle over CSX. successor to Chesapeake Beach Ry. Motive power and some rolling stock still exist on other RRs. *Washington, Brandywine & Potomac RR (et al)…Chartered -1858 Operated – 1868 -1942 This line was originally planned to run to Point Lookout MD to provide shipping for produe and seafood to Baltimore and points beyond. Right-of-Way still visible from Hughesville MD to USNAS PaxRiver MD. Rail ops still existing from Brandywine MD to PEPCO Chalk Point, MD generating plant. See also notes farther down this post. *Brandywine & Cedar Point RR (USN) 1942 – 1954 See Wash,Brand & *Potomac RR. This RR had MANY names throughout its existence. *Brandywine & Cedar Point RR (PRR) 1954 – 1966 (Operated for USN by PRR) Artifacts, mileposts and foundations still located along the line. *Brandywine & Cedar Point RR (Lagenfelder Construction Co.) 1966 – 1975 (Salvage and Scrap) Right-ofWay can be followed all the way to Point Lookout MD where the original terminus was planned. A spur was also graded to St.Mary’s City MD where it can be found running over the campus of St.Mary’s College MD. This is visible in satellite photos as of this date. *Philadelphia,Wilmington & Baltimore RR (PRR) Pope’s Creek MD Branch… Chartered – 1858 Operated 1862 – 1971 Served potomac Shore ferry to VA and also later a small SMECO generating plant. This branch survives as the PEPCO Morgantown Power Plant line and the line to Pope’s Creek went out of service about the same time that the USN branch was salvaged in 1974-6 by Lagenfelder Construction Co. Artifacts can still be found along the line. *Washington, Baltimore & Annapolis Railroad…Chartered in 1899 Operated 1900 – 1935 This was a combination of acquired shortlines, interurbans and new construction that eventually made up the WB&A. Parts of the WB&A survive as Baltimore Light Rail (Severn, Odenton, Linthicum MD), some industrial switching spurs at Naval Academy Jct, Odenton MD, and some abandoned trackage still exists as places along the line such as Ft. Meade MD, and Bowie race track MD. Some rolling stock exists on other RRs. *Washington, Baltimore & Drum Point Railroad… Chartered in 1868 Partially constructed by 1914 never completed due to industrial competition from Baltimore MD, Right-of-Way still visible from Parole MD where it would have interchanged with WB&A to Owings MD where it would have interchanged with the Chesapeake Beach Ry and finally to its terminus on the banks of the Patuxent River as Drum Point MD. Several roads and other development has been built over the ROW but it is easily seen from satellite photos even today. August 17, 1887 – Washington, D.C., United States: Baltimore & Ohio Cincinnati, Chicago and St. Louis Express enters the city from Maryland, out of control. At sixty miles an hour it derails on curve at Terracotta, demolishing several buildings as well as the train set. The engineer had been trying to make up time when he discovered that his brakes had failed. The engineer is killed and many passengers injured. January 15, 1953 – Washington, DC, United States: The brakes fail on Pennsylvania Railroad’s westbound Federal Express passenger train; the train barrels through the end of track barriers and stationmaster’s office at Union Station in Washington, DC, but nobody is killed in the accident. President-elect Dwight D. Eisenhower’s inauguration is scheduled the following week and there is no time to extract the GG-1 electric locomotive from the basement of Union Station where it ended after the floor of the concourse gave way, so the hole is planked over for the celebration week and after the inaugural festivities, the unit is cut up into three pieces, hauled to Altoona, Pennsylvania where it had been built and is welded back together to serve for another three decades. GG-1 No. 4876 is in the collection of the Baltimore & Ohio Railroad Museum in Baltimore, Maryland. November 3, 2004 – Washington, DC, United States: One subway train lost its brakes and rolled backwards into the Woodley Park-Zoo Station, slamming into another train. Twenty people were injured in the crash. This railroad carrier was incorporated in 1901, by Congress. In 1902, The Philadelphia, Wilmington & Baltimore and Baltimore and Potomac were consolidated as the Philadelphia, Baltimore & Washington, which formed the Washington Terminal Company with the Baltimore & Ohio to build a new Union Station in Washington D.C. In 1907, Union Station Washington D.C. opened. Mergers, Penn Central and Amtrak changed all that. By 1986, the Washington Terminal Company was completely taken over by Amtrak.